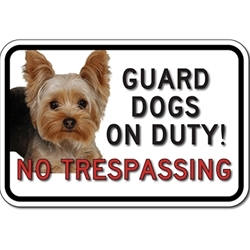 Custom Guard Dog photo No Trespassing Sign with YOUR Dog Photo - 18x12 - Email us a high resolution file of your favorite dog and we will add it to the sign. Reflective Aluminum Guard Dog Signs rated for 7-plus years of outdoor service without fading. Your Custom Security Signs Will Ship in 3-5 Work Days After You OK the Proof! You can DOUBLE the working life of your Design Your Own Custom Video Surveillance Signs by adding 3M Protective Overlay Film (POF)! 3M’s high-tech POF protects sign faces against fading caused by the sun and harsh weather—and makes graffiti and sticker defacement damage easy to clear away without harsh abrasives.